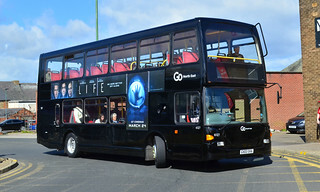 Following the entry into service of the former Go-Ahead London General Wright Eclipse Gemini 2 bodied Volvo B9TLs at Stanley; this vehicle has been temporarily withdrawn from service at Stanley, and, ahead of allocation to Riverside Depot for the Jewish Scholars private contract, are undergoing removal of advertisement frames, all internal and external vinyls removed, tidy-up black repaint, and having their tachographs calibrated. Upcoming service changes in May will see the "Toon Link" brand encompass services 6, X30/X31 and X70/X71 with a mixed allocation of Scania OmniCitys and Scania OmniDekkas. This vehicle has consequently received "Toon Link" branding, following repaint. Upcoming service changes in May will see the "Toon Link" brand encompass services 6, X30/X31 and X70/X71 with a mixed allocation of Scania OmniCitys and Scania OmniDekkas. 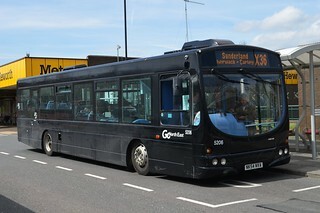 As such; having previously carried a plain red base livery, this vehicle has now been repainted into a plain black base livery. 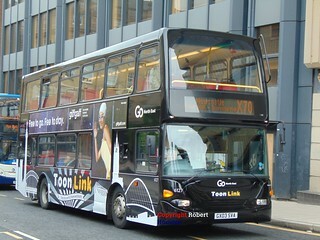 "Toon Link" branding will be applied to the bus nearer to the time of the service changes. 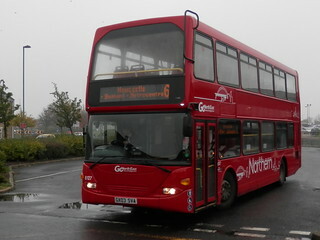 This vehicle has had its "Northern" branding removed, and hence now carries a plain red base livery with Go North East fleet names. 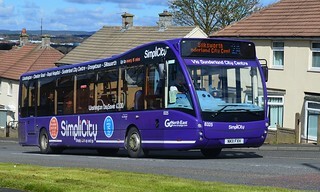 This vehicle has received "Northern" branding, which is the new brand name for services 6 and X70/X71. As part of recent service changes, new service 6 was introduced as a replacement for the northern section of the old "Diamond" 43/44 services, so the name is appropriate for the route as well as commemorating the company's heritage with a fresh modern outlook on the "Northern" name. This vehicle has now entered service at Stanley Depot. Go North East has acquired a number of Scania N94UD/East Lancs OmniDekka vehicles from sister Go-Ahead operating company Brighton & Hove, following the entry into service of new vehicles. 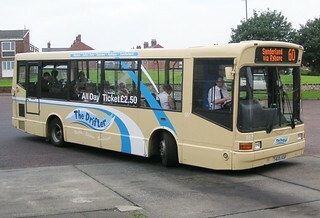 This vehicle, previously numbered 611 within the Brighton & Hove fleet, has now arrived at Saltmeadows Road and is undergoing preparation for service within the Go North East fleet.